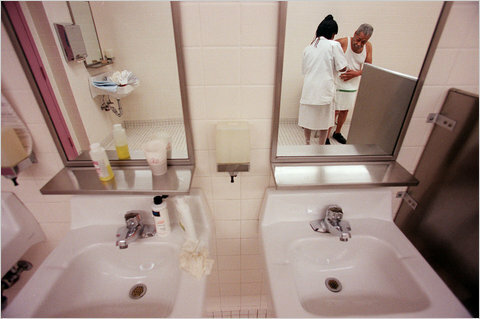 Chang W. Lee/The New York Times A certified nursing assistant helping an Alzheimer’s patient at a nursing home in New York. While looking at nursing homes for my mother, I always asked the tour guides if I could talk to the nurses’ aides. This seemed to me a logical request. After all, these were the women — and they were all women — who would spend the most time with my mother, who would notice small changes that raised big questions, who would make her feel cared for. Or not. “They don’t do that,” I was told almost everywhere I visited. I soon realized why. In casual conversations in hallways and dining rooms at more than a dozen facilities, I found only one nurses’ aide who had been on the job more than six months. I was witnessing in real life one of the most dismal statistics in long-term care: More than 70 percent of nurses’ aides, or certified nursing assistants, change jobs in a given year. Then came the tour guide who didn’t say no. “No one has ever asked that before, but why not?” the marketing director of a New Jersey nursing home said in response to my request. He said he would ask three aides then on break if they wanted to talk to me. They said yes. I decided this was the place for my mother. These women used the word “we” when talking about the nursing home, making clear that they felt a sense of ownership. And it seemed significant that the marketing director asked their permission before allowing me to impose on their break time. Moreover, he trusted them enough to leave me alone with them in the break room. That was 10 years ago. I do not know exactly what I would find today, but the overall situation has not changed. The reasons for the high turnover rate among nurses’ aides are the same as they were then: low wages ($10.48 an hour on average), poor benefits, high injury rates and lack of respect on the job. What has changed is that the industry, the federal government and the states have all identified the turnover rate as a crisis in long-term care, particularly with demand poised to soar as the baby boom generation ages. Researchers have found that high turnover in a facility corresponds with poor quality of care — more bedsores and more use of restraints, catheters and mood-altering drugs. That is, more reliance on medicine and technology, less on relationships. “Cycling in aides who don’t know you is very disorienting and upsetting, and the resident is the one who suffers on the quality end,” said Peggy Powell, a senior staffer at PHI, formerly known as the Paraprofessional Healthcare Institute, a nonprofit group focused on improving the front-line work force in long-term care. In nursing homes with high turnover rates, certified nursing assistants tend to leave within three months, often because of inadequate training and support to juggle multiple frail, ailing residents at a time, according to Robyn Stone, senior vice president for research at the American Association of Homes and Services for the Aging. Once aides leave, everyone else must pick up their caseloads, and the stress of the job rises. Culture change initiatives are under way in nursing homes around the country to make aides’ jobs more fulfilling — not so much through better pay, but by offering better training, more responsibility and more respect from superiors. The aides at my mother’s nursing home had all this, plus health and pension benefits. Ericka Dickens had been there for nine years when she became my mother’s aide. She had the patience and experience to navigate my mother’s stormy moods as her dementia worsened, to notice immediately when she was feeling weak or sick. Sometimes I would arrive in the early morning to find Ms. Dickens sitting beside my mother, holding her hand and talking to her. U.S. District Judge William Hart's 24-page order, signed Wednesday and made public Thursday, paves the way for sweeping nursing home safety reforms signed into law by Gov. Pat Quinn this year. And it sets in motion a schedule for state officials to offer about 4,300 mentally ill people the opportunity to move out of two dozen large nursing facilities known as institutions for mental diseases, or IMDs. "It is a critical step in reforming an outdated system in Illinois," said Benjamin Wolf, associate legal director for the ACLU of Illinois, one of five legal organizations representing the mentally ill nursing home residents. Hart's ruling gives final court approval to a consent decree hammered out between state authorities and a class of mentally ill nursing home residents who sued five years ago on the grounds that they were not being housed in the least restrictive setting appropriate to their disabilities, as required by federal law. The ruling will bring federal court oversight to Quinn's push for alternative treatment and housing options for psychiatric patients currently housed in nursing homes. More than any other state, Illinois relies on nursing facilities to house younger adults with mental illness, including thousands with felony records. A recent Tribune investigation detailed incidents of violence and drug abuse in some facilities where psychiatric patients got little treatment or supervision. In his ruling, Hart acknowledged a substantial segment of IMD residents or their families opposed the settlement because they feared the specialized facilities would close, leaving residents "out on the street" without medication or food. But Hart said the consent decree "expressly provides that residents will not be left without appropriate housing options due to an IMD closing and that no one will be discharged from an IMD prior to appropriate housing arrangements being made." Opponents of the consent decree also said in court papers that it "purposefully" lacked details on how the new housing and treatment would be administered. But Hart rejected that argument, too, writing: "The decree sets forth details of the type of community services to be offered. ... The level of detail in the decree itself is sufficient." Under the settlement, every resident of an IMD will be offered an evaluation to determine whether he or she is eligible to be moved into a less restrictive setting and what is needed for that person to thrive there. The evaluation is voluntary, and residents can decline to take part and remain where they are. All IMD residents must be offered an evaluation within two years and then annually after that. The settlement outlines a strict timetable for moving those who want to leave the IMDs — slowly for the first two years, then more rapidly as the state builds its capacity for serving and treating people in communities. Those who move will be placed in so-called supportive housing — subsidized apartments or group homes where staff are on-site or visit frequently to provide therapy, job and life-skills training, substance-abuse programs, and case management. Under the consent decree, state officials made a legal commitment to provide the housing and support services, and the court will appoint an expert to monitor compliance. Hart agreed with state officials that the community care will be less costly for the state than housing people in IMDs, which are supported by 100 percent state funding. As people move into community-based settings, he wrote, the state will be eligible to receive federal Medicaid reimbursements for their medications and health care. Hart ruled that the state must now pay nearly $2 million in attorney fees and costs to the ACLU and the other groups that brought the case, but he called the amount "reasonable" given the years of litigation involved. The fees won't be kept by the attorneys, he said, but will go to advocacy groups for the disabled that supported the litigation. Hart also noted that the U.S. Justice Department filed court papers urging him to approve the decree. For all the “conversations” this nation has regarding race issues, it seems that this should not be a concern: Residents/patients having the “right” to chose nurses, aides and other caregivers based upon their race. But it happens, often. It’s wrong. It’s discriminatory. And it’s about time something changes to end this. Indiana recognized this and have made it illegal. INDIANAPOLIS (AP) – Certified nursing assistant Brenda Chaney was on duty in an Indiana nursing home one day when she discovered a patient lying on the floor, unable to stand. But Chaney couldn’t help the woman up. She had to search for a white aide because the woman had left instructions that she did not want any black caregivers. And the nursing home insisted it was legally bound to honor the request. As usual, laws are written without legislators thinking of the consequences. It usually takes a few years for the full effect of these consequences to come to light. Elderly patients, who won more legal control over their quality of life in nursing homes, sometimes want to dictate the race of those who care for them. And some nursing homes enforce those preferences in their staff policies. Chaney, a 49-year-old single mother who at the time was helping to put her only son through college, initially went along with the policy despite her misgivings because she needed the money. The nursing home said it was just following a long-standing interpretation of the patients’ rights law. “The rules say this is their home and everyone else is just a visitor there, including staff,” said McSharar. We work in a high stress field. No one deserves to be singled out for any reason, rejected and actually written off as a “patient right” issue. I’ve seen the opposite happen as well: Black residents refusing care from white (or Hispanic or Asian) aides. An aide is an aide. A nurse is a nurse. We all have the same basic training and are fully capable of doing our jobs. It’s about time older people understand this.